Sensory tubs are great for mat time (blanket time) or as a table activity and are excellent for when you need to school older children, cook dinner, or during any other time when you need your little ones well occupied and absorbed in a worthwhile activity. They are quick and easy to put together, cheap or free (depending on what you already have lying around the house) and can be used daily as part of your flexible routine for babies, toddlers, preschoolers and even older children. Obviously the materials you present will change according to the age of the child who will be playing with them, with safety always a factor for little ones who may put small items in their mouths. There is no limit to what you can put into your tubs. Ideally the materials will be open-ended; that is they can be combined and used in a variety of ways. Younger toddlers do not have a well-developed imagination and therefore need more hands-on options, rather than pretend play materials. For example, in the trains tub above, I included a variety of scoops and containers to fill, transfer, tip and pour as well as the trains themselves. A young toddler may examine the trains before setting them aside in favour of transferring the stones from container to container. The older children may go straight for the trains and set up a complicated rail system with rocks delineating the tracks and the containers used as sheds for the trains. Another may decide to serve dinner on the silver pie tins or set up a picnic for the trains. I find that the tubs themselves are not large enough for the children to play within. They like to sort through, put aside what they are not using and generally spread out, so I use a blanket or sheet for them to play on. When play time is finished, the corners of the sheet are lifted up and all the materials can be quickly tipped straight back into the tub without a tedious pack-up session. 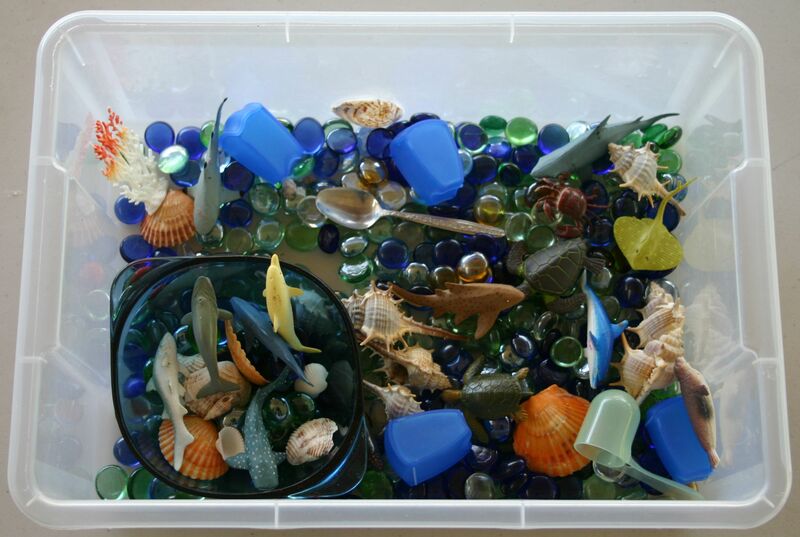 Blue and green gem stones, plastic sea animals, shells, bowl, spoons, scoops and empty pill boxes. This tub covers opening and closing skills, spooning, scooping, tipping, pouring (all transferring skills) and could be extended to sorting and categorizing as well as the pretend play options. My youngest daughter used the pony and jewel tub this morning for the first time. She carefully removed all the ponies and put them back in the box before making a picnic for her teddy bear and the 12 disciples (!) with the containers and jewels. The older girls (6 and 8) have already asked to use it later and tell me they plan to set the jewels up as food for the ponies. The beauty of open-ended, attractive materials is that they will appeal to a variety of ages. My 15 month old can barely restrain himself and wants to dive straight in whenever he sees these tubs out. Unfortunately the pieces are just too small for him to use safely. This is the 15 month old’s sensory “tub” this week. He loved it and used the scoop (a large measuring spoon) to transfer from the large basket to the small bowl, filled and stacked the metal cups and filled and tipped out the basket numerous times. Provide a container or two and something to put in and dump right back out again and it will always be a hit with anywhere from an 8 month to a 2-year-old. 12 to 18 month olds particularly love to fill and dump. For a stack of ideas to fill your sensory tubs,see this post. Many of the other ideas I have posted as table activities, highchair activities or mat time activities would all work in a sensory tub. 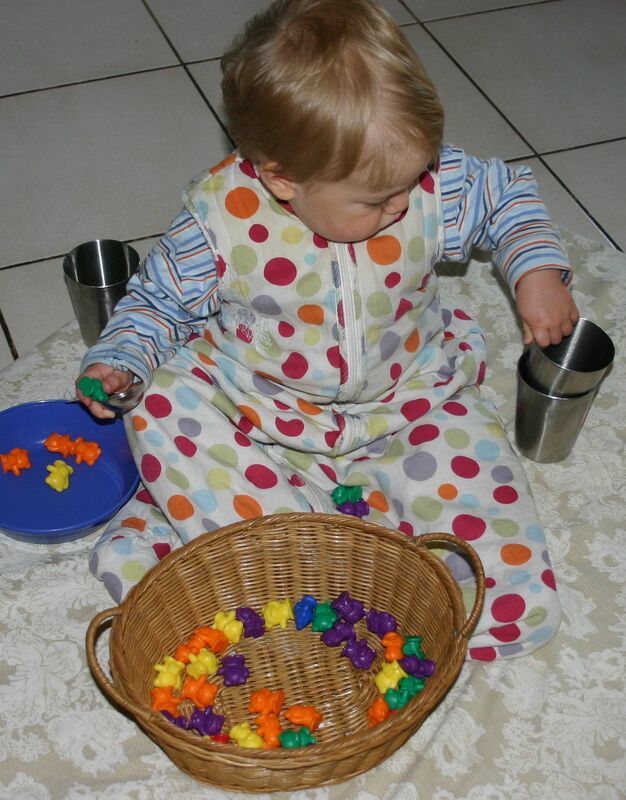 See pasta play and teddy food play as examples. For your 15 month old, his sensory tub for the week was the counting bears, was it that he had the same tub for the week during his mat time? Did you swap for another one half way through his time? I am having a a hard time keeping my 18 mth old on his mat. I only put 10 mins on the timer and he is off the mat after about 3 mins. I tell him to get back on, then he goes into his cot when he does it again. Till the timer beeps. He does need a change in his activities which I,m sure is part of the problem. He would use it for around 15 minutes each day and then go on to something else (books, cars etc.) Mat time usually lasts for 20 to 30 minutes while I cook dinner and 1 activity by itself will not often last the entire time at this age. The following week he would have a “new” sensory tub/box of toys. (Rotating toys keeps things interesting.) Every child is different. You may need 6 activities that change every 5 minutes to get to half an hour. 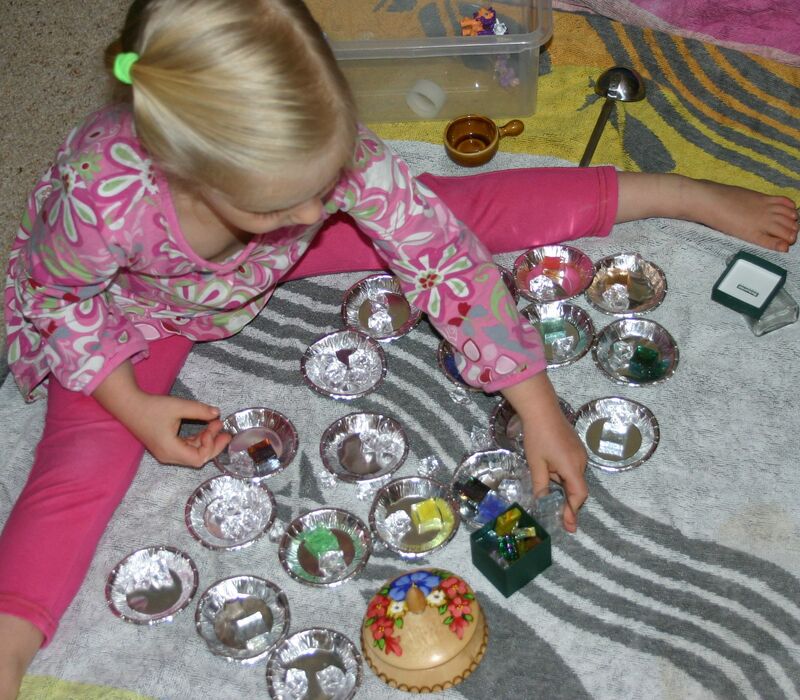 Some info on how to extend the time is in this post: https://angathome.com/2013/04/02/montessori-style-practical-life-tray-activities-for-toddlers/ The reality is that by 18 months you may need to give some consequences for getting off. I use several with my own children but you will need to find what works for you. Why don’t you get hold of the “Terrific Toddlers” book by Mel Hayde. Some excellent how to’s in there.